The world to come, age to come, or heaven on Earth are eschatological phrases reflecting the belief that the current world or current age is flawed or cursed and will be replaced in the future by a better world, age, or paradise. The concept is related but differs from the concepts of heaven, the afterlife, and the Kingdom of God in that heaven is another place or state generally seen as above the world, the afterlife is generally an individual's life after death, and the Kingdom of God could be in the present (such as Realized eschatology) or the future. Four Horsemen of the Apocalypse, an 1887 painting by Victor Vasnetsov. The Lamb of God is visible at the top. Under Christian eschatology, the phrase is found in the Nicene Creed (current Ecumenical version): "We look for the resurrection of the dead, and the life of the world to come." It is also found in the King James Version of the New Testament at Matthew 12:32, Mark 10:30, Luke 18:30, Hebrews 2:5, Hebrews 6:5. Other related expressions are "age to come" which is typically found in more recent translations, Kingdom of God, Messianic Age, Millennial Age, The New Earth and New Jerusalem, and dispensation of the fulness of times and possibly also eternal life. There have been a number of unsuccessful predictions of the date of the Christian End Times, despite Jesus' admonition at the end of the Olivet Discourse that only God the Father knows when the end times will begin (Mark 13:32–37). Under Hindu eschatology, the current age is the Kali Yuga, a period of decline. Kalki ('Destroyer of Filth') will appear to purge all evil, beginning a golden age of Satya Yuga. HaOlam HaBa, or "the world to come," is an important part of Jewish eschatology, although Judaism concentrates on the importance of HaOlam HaZeh ("this world"). The afterlife is known as Olam haBa, Gan Eden (the Heavenly Garden of Eden) and Gehinom. According to the Talmud, any non-Jew who lives according to the Seven Laws of Noah is regarded as a Ger toshav (righteous gentile), and is assured of a place in the world to come, the final reward of the righteous. In Zoroastrian eschatology, the world to come is the frashokereti, where the saoshyant will bring about a resurrection of the dead in the bodies they had before they died. This is followed by a last judgment. The yazatas Airyaman and Atar will melt the metal in the hills and mountains, and the molten metal will then flow across the earth like a river. All mankind—both the living and the resurrected dead—will be required to wade through that river, but for the righteous (ashavan) it will seem to be a river of warm milk, while the wicked will be burned. The river will then flow down to hell, where it will annihilate Angra Mainyu and the last vestiges of wickedness in the universe. There have been a range of dates predicted, purportedly from different methods of calculation. Sri Potuluri Virabrahmendra Swami, for example, wrote 400 years ago in his Divya Maha Kala Gnana, or 'Divine Knowledge of the Time,' that Kalki would arrive when the moon, sun, Venus and Jupiter entered the same sign. This is not a rare occurrence and last happened in early 2012, passing without event. 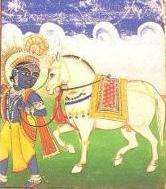 The time of arrival of Kalki has not been consistently asserted by astrologers. ↑ "The Nicene Creed". Christian-bible.com. Retrieved 2012-01-08. 1 2 Chandra, Suresh (Aug 15, 2012). Encyclopaedia of Hindu Gods and Goddesses. Kindle Edition. ↑ Santanu Acharya. "Hindu Prophecies: Translations from the Kalki Purana". Ww-iii.tripod.com. Retrieved 2013-01-20.